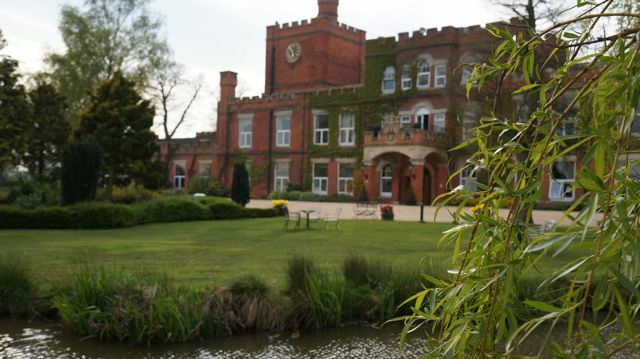 Just miles from Melton Mowbray, this peaceful spa within the Leicestershire countryside is a destination for single spa guests, couples, groups, families alike. There really is not one demographic for this fantastic location. I saw many different guests whilst visiting, including many lone men and one lady even told me she had been visiting since the 1980’s – now that’s dedication! Ragdale Hall opened it’s doors over 40 years ago back in 1976 and their strap line read “What a beautiful way to slim” – A one week stay in a “single with lavatory and shower” cost £88 with a daily massage, sauna and solarium. Every room has it’s own TV and telephone” – guests were only allowed 500 calorie per day too, how times have changed! 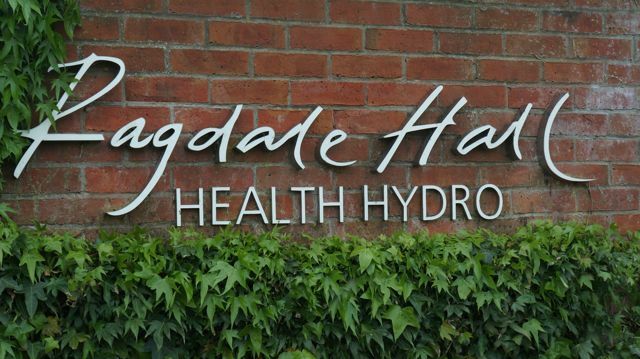 Prior to this, the hall had been a country club, night club and even a restaurant before being purchased by Slimming Magazine who created Ragdale Hall Health Hydro. In June 1990 the present owners, Gary Nesbitt and Michael Isaacs, founders of Our Price Records, bought Ragdale Hall. A complete programme of refurbishment of the entire premises took place to dramatically upgrade the decor. The facilities and services have evolved since doors first opened, but their core values have remained the same, which is why I think so many guests love to return. On driving through the morning fog, past my favourite cycling destination (Rutland Water) and losing my sat nav signal as I drove, the map and directions provided by the spa through the post were a godsend and led me directly to my destination, problem free – a complete miracle for me. As I walked through the grounds of this prestigious spa, I wasn’t greeted by a human at first, but the resident feline friend who lives at the spa. I had visited many years before and hadn’t forgotten the resident cat, curled up and warm by the fireside as he napped. I gave the moggy a quick tickle and stepped into a welcoming reception area, covered in wood panelling with grand oak doors and staircases everywhere I looked. I felt at home. The friendly team took me to the Garden Room Bar for a welcome drink and went through my itinerary for the day, before physically walking me to the day guest changing area and offering to take me on a tour of the spa should I require. 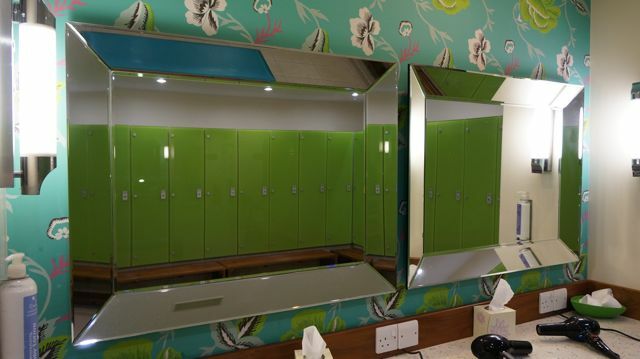 My locker (number 8024) was large, with two shelves, one perfectly designed to pop my smelly gym trainers onto, complete with air vents to keep the air circulating once closed – I liked this little thought. The locker also had a hanger for my coat and it was adorned with my fluffy bathrobe and slippers, beckoning me to put them on and start chilling out. But first, a quick warm up in the gym with a run in the treadmill (yes, I’m changing, I know!) and a quick thrust of the kettlebells before I headed for my second “Fitsteps” class of the year in the studio next door. I absolutely loved this class, luckily I had already been introduced to this dance-based class (created by some masterminds behind BBC’s “Strictly Come Dancing”) before at another spa and as the teacher launched straight into the hour-long dance class, I was actually getting some moves spot on instead of my usual skipping around like a clown. I’ve found if you get your sweat on FIRST, then you can enjoy a guilt-free lunch and pampered afternoon, safe in the knowledge that you’ve worked as hard as you need to for rest of the day. I headed straight to the dining room after my flailing around in the gym and dance studio and enjoyed a table for one in the main restaurant. I enjoyed a delicious leek & potato soup as a starter, followed by a choice of mains, of which I chose the chicken (both cold and cooked) with salad and grilled vegetables to ensure a light offering before I went swimming and running around that afternoon. 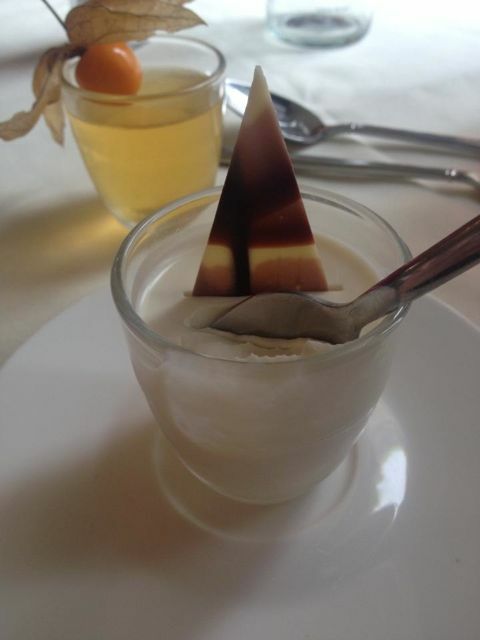 Pudding was too delicious to turn down, with a selection to eat my way through – I went for an apple & elderflower jelly AND a light lemon posset for a duo of sweet treats to end a relaxed meal. Most guests were picking two or three, as really they only contained three or four bites each… that’s my excuse and I’m sticking to it! The service was professional and I had a waiter serving me water and my starter to the table, of which there was a choice of still or sparkling water offered and served to me in a very formal way. Surrounded by oak panelling, a background piano playing to everyone who wanted to listen and stunning glass chandeliers dropping from the ceiling, I felt as though I could be at The Ritz – this was a real treat and I wasn’t rushed, but encouraged to take my time and enjoy everything that was on offer. Champagnes and wines are also on offer and should you wish to enjoy an afternoon tea with your spa visit, you can curl up in the Verandah Bar, Lounge & Terrace for this or simply for a cup of coffee and a slice of homemade cake throughout the day. A candle pool, indoor and outdoor waterfall pool (which was lovely to swim and move around in with the sunshine shining onto my face as I went), colour flow cave, volcanic salt bath, rose sauna, thought zone, scented room, cave shower, experience showers and foot baths. My favourite room was the candle pool, a dark and warm underground cave of which you needed to swim through to find a quiet corner and lay in a warm bed under the water, surrounded by soothing music – it’s the perfect corner to hide away or meditate for a short while, I loved it. 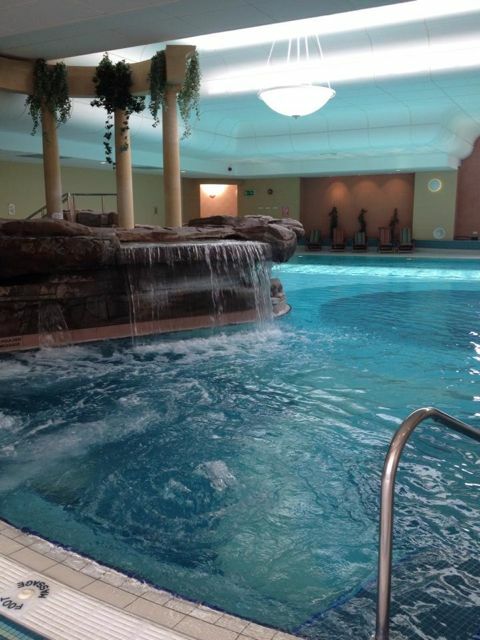 There’s also 25 metre swimming pool with two whirlpool spas, water cascade and massage jets, as well as a separate exercise pool with aqua gym equipment. There’s certainly plenty of space and as most people were still at lunch whilst I indulged, I pretty much had the Thermal Spa facilities to myself, I nearly fell asleep as I floated my way around all of these invigorating caverns and cosy nooks – I’d challenge anybody not to, it’s tricky when you feel so relaxed. There’s even a brain training room called the “Mind Gym” complete with puzzles, games and a furry wall to help train your thoughts and feelings… this reminded me of a scene from the film “Get Him To The Greek”, where Russell Brand strokes the furry wall in a Vegas hotel room when tripping on something naughty to calm him down – I couldn’t help but chuckle as I found myself stroking the furry wall. Not only is this a peaceful retreat from the rest of the spa, but it’s one of the only locations throughout with a strong WiFi connection, so a few of us (ahem) were sat here connecting to the outside world on several occasions throughout our stay – just terrible, I know. The Beauty Express bar is a one-stop area for a quick fix such as “Let’s go lashes”, “HD Brows” and “shellac” long lasting nail colour as well as a brand new hair salon open for conditioning, re-styles and finishing hair treatments to make you feel glam whilst spending some time here. This is just off the main treatments reception and you can simply call in throughout your visit to book yourself up for anything service that may take your fancy. My combined one hour back massage and facial was with a therapist named Mikken and she went through any problem areas I might have (stressed shoulders, of which she worked hard on for me) and discussed any allergies, etc before getting started. Her back massage was out of this world and I would seriously have chopped in the time for a facial for more on my back. The pressure was just right, I nearly fell asleep and the smells from the oils were amazing – I could still smell them on me the next day, even though I had showered twice since, just fantastic. The only odd part about the massage was the couch I was lying on, it had a scrunchie-like head support which was ruffled and didn’t make for a very comfortable face rest as I stared at the floor – had this been smoother to lay on, I most likely would have drifted off. I also got thinking afterwards about just how confident I’ve become since losing my weight over the previous months and how much easier I find it to strip down for a stranger to massage me. Going to a spa is in fact a very intimate experience at times, especially when you are literally put in the hands of a stranger for an hour or two. They will be groping your collar bone, pressing on your hips and cutting it mighty fine to your chest area… A few years ago I’d be shaking at the thought, but now, give me more – I love it and this massage is up there with the best I’ve ever had. If you can personally request Mikken, I’d suggest you do so, she’s fantastic with her hands that girl, she worked wonders on my shoulders and lower back and helped me prepare for a busy week ahead. “The Retreat” was the perfect hideout for a 30 minute snooze after my massage. I headed here thinking it would be a dark and serene room for me to curl up in, but I was pleasantly surprised to find that this room was in fact bright and breezy, within a corner of the hotel area decorated in cream & florals, soft furnishings to curl up into, even a wooden sleigh bed and a sturdy looking porch sofa hanging from the ceiling, it was so inviting, I just couldn’t resist it. A few guests joining me decided to wrap up under blankets at the foot of each furnishing and snore themselves to sleep, whilst I enjoyed the view and watched the world go by, it was paradise. I had to wake myself up, as I knew I would, as I was only here as a day guest today. A quick swim in the exercise pool and I was blow drying my hair and ensuring I was refreshed and as awake as possible before my drive home. It’s even closer to Cambridge than the spas I recently visited in Norfolk and it’s well worth the hop over for. But, if like me, you have to slap yourself with ice cold water before you get in the car following a spa day, there’s no better excuse than stopping for the night. On arrival I stood at reception for a few minutes before being looked after. The gentleman who welcomed the couple in front of me had spotted me, but didn’t acknowledge that he would be with me shortly – a little nod or a “be with you in a moment” would have been fine. Not a huge problem, as I was soon spotted by another staff member who was perfectly polite and professional in her welcome. My massage therapist mentioned when leaving the room to let me get undressed that she would knock on the door when she was coming back in, however she didn’t, she walked straight in and startled me a little. She also did this a second time on getting dressed again afterwards, so a little nod to this as it could cause irritation to somebody who isn’t ready. Guest etiquette 101: If you take a glass or mug into a room that’s away from the main dining areas, please take it away with you afterwards – Surely? !… Various communal rooms had used cups & glasses left behind on bookcases, side tables and under chairs. These rooms could do with being checked by housekeeping staff on a more regular basis to ensure this doesn’t make the venue look messy, as personally, this puts me off taking a seat somewhere I might want to sit. I really wish guests would simply take it back to the dining or bar area, but we all know people can be lazy with this. 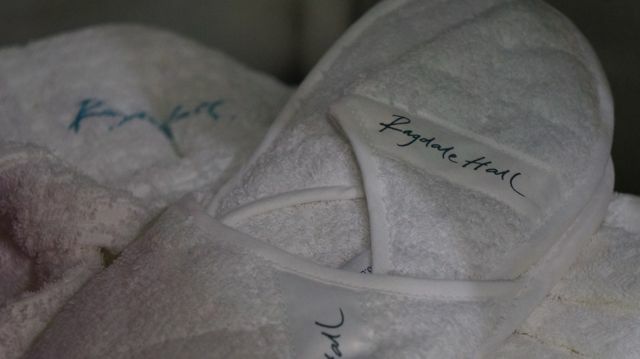 Ragdale Hall is a busy spa, but you only really notice this within the treatment reception, where it’s a bit crazy and “health farm-like” with names being called out erratically. However, I spent time in the thermal spa area for around an hour and a half after lunch, not bumping into many people, just a handful in fact. It’s a well thought out spa in this respect, it’s large enough that even with hundreds of guests inside, you still feel alone for the most part. I only saw just how many guests were there at lunchtime, as the large dining room staggered diners from 12pm onwards and even then, we weren’t on top of each other – there’s still a level of intimacy throughout of which I loved. On visiting the gym before some relaxation, I was greeted with a smiling fitness instructor who offered me advice and guidance on the equipment or a workout plan, should I require. Not many spas I’ve visited recently have had a professional staff member inside the gym itself, so his presence made me work harder and use more of the equipment than I may have done otherwise. You are invited to be as relaxed as you wish, with a mix of guests wearing gym gear versus robes and slippers. I opted for my gym wear at lunch, however I wouldn’t have felt out of place had I wanted to recline in my whites for the afternoon, it’s very relaxed, whilst still offering a formal dining service, complete with linen napkins and tablecloths. There is a certain charm to this spa, it’s an old house with a lot of interesting history to it, they even host talks and tours of the hall for residential guests of an evening – I’d have been keen to have gone on this if I’d stayed longer. The house is kept beautifully, it’s not shabby or sterile, it’s tastefully decorated with a mix of old British classics splashed with modern twists and colour. It’s clean and tidy as a general rule and music plays in communal areas – it really helps with the relaxation. There’s a tennis court, an outdoor swimming pool and acres of countryside to explore in the warmer months, I can just imagine lounging in a deck chair by the lake, playing croquet on the rolling lawns or reading a book in my robe on a sunny day – pure heaven! 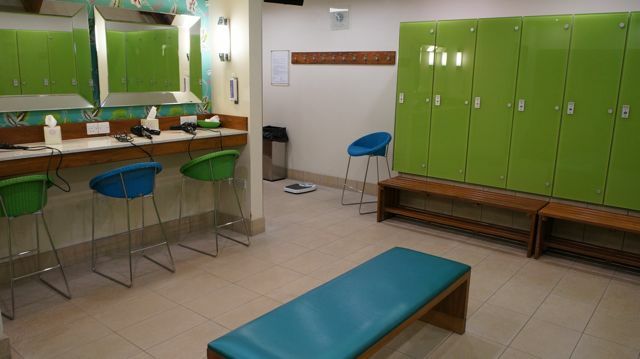 Bring your swimsuit (no need for towels as there’s plenty here to use) and your gym kit for a little activity throughout your stay. The classes and gym are not to be missed for a quick wake up after a long drive – I used it to stretch out before my “FitSteps” class and it was the perfect way to stretch out within an air-conditioned room on a warm day. There’s a boutique shop to buy outfits, swimsuits or gym gear, as well as forgotten toiletries or a magazine should you require. There is also a small gift shop with beautifully handmade greetings cards & gift ideas for a leisurely browse as you wander around. 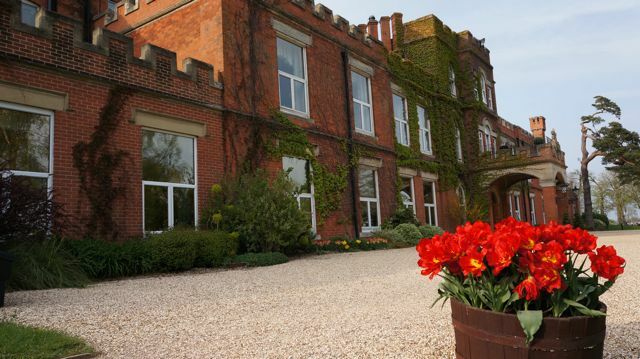 With a dedicated team of over 470 staff with specialist services such as a dedicated guest liaison team and valet parking, 83 bedrooms and suites, this is a perfect countryside retreat for a day or a week – there’s really no end to the packages on offer. They regularly host special events and even fitness & pilates retreats or running & walking breaks for the more active guests. Great write up! You really summed it up perfectly. I love Ragdale Hall – I’ve been three times now (twice with friends, once on my own.) I love how you can actually go on your own (and eat in the dining room) without feeling like a lemon. 😉 It’s a fantastic place to de-stress. I truly love this venue! You’ve got it spot on, you don’t feel like a lemon here, unlike some other venues as a lone diner can make you feel. I will be heading back when I can do so!